CHINHOYI, Zimbabwe (CNN) -- Zimbabwe President Robert Mugabe was celebrating his 85th birthday with a lavish all-day party Saturday despite the fact that the country is gripped by an economic and health crisis. 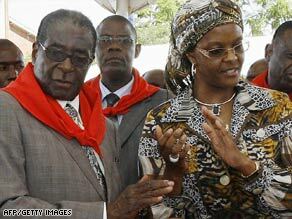 President Robert Mugabe and his wife, Grace, attend a cake-cutting ceremony for his birthday Saturday. Mugabe's ZANU-PF party said it raised at least $250,000 to hold the party in Mugabe's hometown of Chinhoyi, about 120 kilometers (75 miles) outside of the capital, Harare. Critics of the president say the country is desperate for that amount of money to be spent instead on its citizens, who are suffering from a cholera outbreak, food shortages, and spiraling hyperinflation. On Friday, Prime Minister Morgan Tsvangirai visited a hospital's closed intensive care unit that he said needed $30,000 to resume operating. He emphasized that the country's "indigenization program" -- which forces all major foreign companies operating in Zimbabwe to have at least 51 percent black ownership -- will be carried out. It began last year and hasn't been implemented yet. Mugabe's birthday falls on February 21 but his party loyalists postponed the celebrations as they were raising money for the event. "I think it is going to be a great day for the legend and icon whose birthday we are celebrating today here," said Mugabe's nephew Patrick Zhuwawo, one of the fund-raisers for the birthday. "The country might be having problems, but we need to have a day to honor the sacrifices the president has made for this country." What do you think about the celebrations? Zhuwawo said about 100 beasts would be slaughtered for the birthday bash. iReport.com: What do you think about Mugabe's lavish party? Mugabe also invited schoolchildren from around the country to attend the party, being held at Chinhoyi University. The farming town of Chinhoyi is usually quiet, but Saturday's event has changed everything. Cars with Mugabe's supporters could be seen hooting and some ZANU-PF supporters sang Mugabe's praises. A banner in Chinhoyi read, "Age ain't nothing but a number." Mugabe invited Tsvangirai, his new partner in a power-sharing government, but a Tsvangirai spokesman said the opposition party leader turned it down. He said it is political party function, with most of the attendees being ZANU-PF elite. As the prime minister, Tsvangirai is not obligated to attend, the spokesman said. The spokesman would not acknowledge whether Tsvangirai had initially agreed to attend, but it was widely reported in Zimbabwean media that he had agreed to do so. "Mr. Tsvangirai has other commitments, as far as I know," said Nelson Chamisa, a spokesman for Tsvangirai's Movement for Democratic Change. Tsvangirai last year said Mugabe's birthday party was "a gathering of the satisfied few." But at that point, he and the president were preparing to face off in a hotly contested presidential election. As Saturday's celebrations began in a carnival atmosphere, just less than a kilometer (0.62 miles) away stood a deserted Chinhoyi government hospital -- a reflection of the country's dire health situation. A few nurses are attending to patients. "There are no medicines. These patients have no option but to come here, but there is nothing we can do," said one nurse at the hospital. On Friday Tsvangirai visited Harare Hospital, one of the country's biggest, and said its intensive care unit will need $30,000 in order to start operating again after a funding shortage. Once a darling of Zimbabwe, Mugabe is blamed for driving the country into a meltdown. A cholera epidemic that broke out in August has since hit every corner of the country, killing 3,731 people and infecting nearly 80,000, according to the World Health Organization, which quoted Zimbabwe's Ministry of Health. The preventable disease has spread through Zimbabwe's 10 provinces through lack of access to clean water, faulty sewage systems, and uncollected refuse, according to Medecins Sans Frontieres (Doctors Without Borders), which released a report this month on the outbreak. The problems, MSF said, are "clear symptoms of the breakdown in infrastructure resulting from Zimbabwe's political and economic meltdown." On Sunday, Tsvangirai appealed to the international community to help Zimbabwe's crippled economy, saying it would take $5 billion to stabilize the country. The cholera outbreak has worsened Zimbabwe's economic crisis. Failed government policies and an acute food shortage because of years of poor agricultural production and widespread corruption have ravaged the currency of Zimbabwe, which has the world's highest inflation rate.